yours look professionally made. Like the kind we see from the Hotel's hi-tea buffet platter! 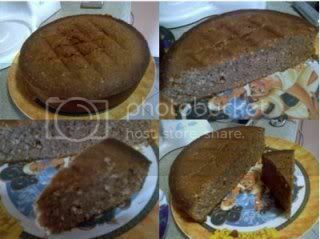 I've baked this cake last weekend, I must say it's really very nice and easy.. my relatives & parents all say this cake is very nice.. Thanks Gina for the recipe.. I also replaced the hazelnut with almonds, cos I mistaken the one I had at home is hazelnut, only realised it when I start baking.. but the taste is as good and the cake is nice..
this is my photo.. sorry, probably presentation wise not as fanastic yet.. will improve on that..
can fondant be used on this cake?